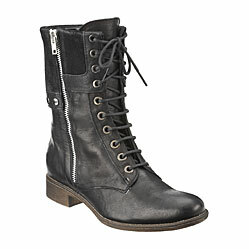 Play it rough in these chic lace-up combat boots by Steve Madden. Wear them with skinny jeans and a cropped coat, or with tights and a floral skirt for a nice contrast. 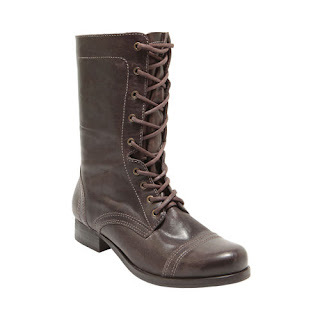 For something more edgy, try this zip-up boot by Nine West. Not only does the zipper add some bling, it's a lot easier to zip up than lace up! And you can always unzip just a little and fold over the top for a more casual, slouchy look. For a non-leather alternative, try this field boot available at Urban Outfitters. 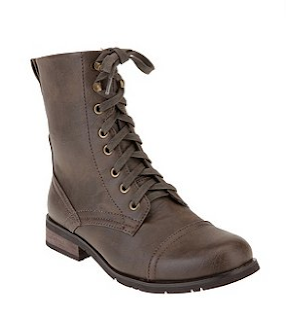 It's a slightly more feminine version of the combat boot, with the low heel, subtle stitching, and rounded toe. FYI, the reviews state that the boot runs big, so go for a size up. Love the utilitarian style, but want something more feminine? Then try on this lace-up ankle bootie from Steve Madden. It's what we imagine the Spice Girls would wear when acting as soldiers during World War I. Rugged but delicate, camouflaged but chic. Power to the world! 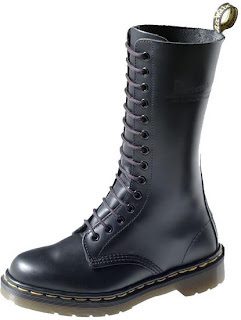 Of course, no list is complete without the classic Doc Martens. These iconic lace-ups are reminiscent of the angst of the early 90s, and if flannel plaid is okay, why not go all the way? Channel your inner Angela Chase (à la My So Called Life) and wear a floral dress with an oversized cardigan and clunky Doc Martens. You'll sure to have Jordan Catalano asking for your number during study break in no time. For a more updated look, try this more subtle boot with a plaid lining. It still has the iconic sole of the original Doc Marten, but the lacing, fabric, and shape are a bit more casual. 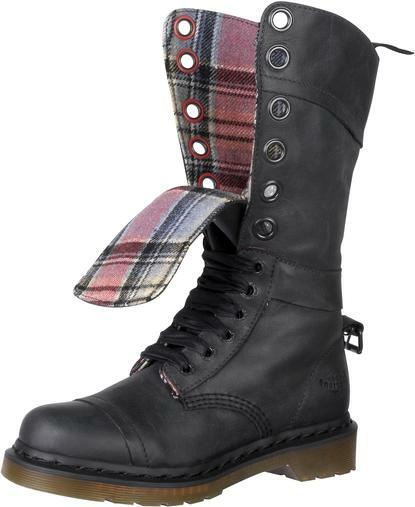 The plaid lining gives this boot a little extra flair, and would be perfect for a day of shopping in rainy November. These boots were made for working! How Much Do They All Cost ?